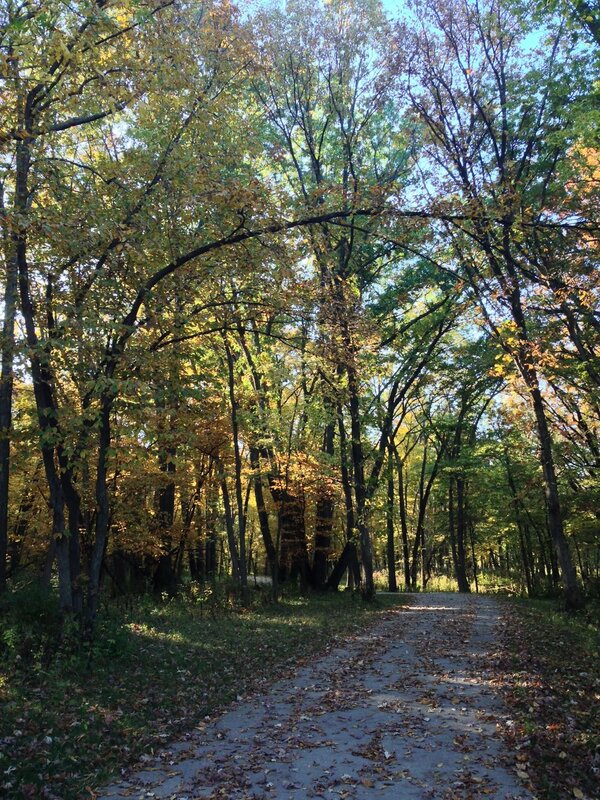 Visiting Urbandale's Bob Layton trail is a great way to seeing fall colors. It's proximity off the Raccoon River Valley Trail makes for a logical side route this time of year. Only two miles in length also it's a lovely spot for an autumn walk. New parking off street parking is now available along Aurora with a picnic shelter coming soon. Tucked between two Urbandale neighborhoods, is the Bob Layton Trail. It's "tiny but mighty" and a good place to find hidden prairie while winding along Walnut Creek. The trail is dedicated to a former Urbandale city manager and travels 2 miles north from where it meets the Raccoon River Valley Trail just south of Douglas. On a recent ride on the Clive Greenbelt I decided to jump ship and check out the trails north of Hickman. I quickly was reminded it's not yet spring when finding portions of the Raccoon River Valley Trail not only under mud, snow and ice, but closed. Taking a detour through residential streets I met back up with the trail where it was closed from the north. Walnut Creek had escaped its banks just enough to create a treacherous mess. I know this only because I always take a drone with me on bike rides and used it to determine the cause of the closure and take a picture rather than (carefully...quietly..quickly) riding past the gates on my bike in stealth mode. After finding the Raccoon not quite open for business I wondered "What about Bob?". That trail also closely winds along the creek bank. Would it be in a similar state? Thankfully the remaining portion of the ride was dry. There were a couple of spots that called for an easier gear. I got the heart rate up and maybe even burned off an extra calorie. A new "fitness area" had been installed along the trail since my last ride through. I stopped to only take a picture because getting in a few quick sets or reps will never....ever... be a reason for me to hit the breaks. 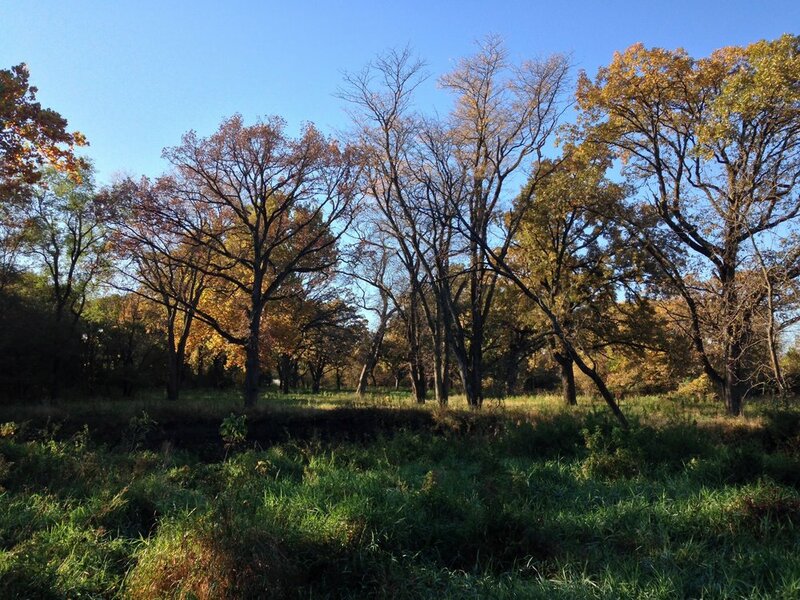 This Des Moines suburb has been diligent in expanding it’s trail system providing residents with connections to the Raccoon River Valley Trail, Clive Greenbelt Trail, and Grimes city trails. Located within two Urbandale neighborhoods, are the Bob Layton Trail and the Little Walnut Creek Trail. These trails are short in length, but certainly don’t come up short in providing a fun bike ride opportunity. Each trail travels through parks and provides some surprises along the way. Little Walnut Creek Trail begins off of Prairie Avenue and winds it’s way west following the creek it’s named after. The trail comes to a halt at Alice’s Road. The Bob Layton Trail, dedicated to a former Urbandale city manager, travels from Meredith to where it meets up with the Raccoon River Valley Trail south of Douglas. I took a lunch time break to explore these two trails and better understand how they connect to other major trails. True, I could have checked out Google Maps, but it’s way more fun to do it in person. Multiple short steep grades did a great job providing easy climbing intervals for a fun workout. I kept my speed on the slower side (always an easy task for me) as several folks were out enjoying the afternoon with a walk. I was surprised to come across a Little Free Library in the wooded area of trail south of Douglas. It’s bright colors contrasted against the browns and greens of the trees. I was also impressed to find a work of art displayed in Walnut Creek Park. Created by Sarah Deppe from Cedar Falls, it perfectly complemented the natural surroundings. Newly built homes were backed up a comfortable distance from the Bob Layton Trail. I bet the folks living here enjoy looking out their windows at the tree line, grasses, grazing deer, and residents using the trail. With the weather getting cooler the mosquitoes must have known their days were numbered. They were out with a vengeance! Stops for pictures were kept short. 35 feet in the air the “spaceship” house can be seen just south of where the Bob Layton Trail meets the Raccoon River Valley Trail. Owned by a real estate mogul, this house is rumored to have a private car wash, art gallery, and an elevator. The views from this unique house have definitely changed with wooded areas and farmland evolving into neighborhoods and busy streets. Did you know the worlds largest hummingbird spends it’s summertime days in a pretty backyard along the Little Walnut Creek Trail? Now you do! This was a fun little adventure. I was glad I took the time to ride these short, but impressive bike trails. Over the years they will bound to extend their reach to keep up with the urban development in Urbandale. Today’s ride was on a mixture of trails located in three different cities. Waukee, Clive and Urbandale. I wanted to head out before the wind picked up too much today . I also stuck to trails where I wasn’t out in the wide open. I began and ended my ride in Waukee at the trailhead for the urban trail. The trailhead has a city map along with bike racks. Unfortunately there is not a bathroom or water fountain at this location. There are several parks along this route to stop and rest or use bathroom facilities (when not closed for the season). The Raccoon River Valley and Bob Layton portions of the trail (both north of Hickman) were new experiences for me. These are both very pretty sections of trail. One piece travels through some beautiful woods. Surfaces varied from concrete to asphalt. All trails were in good condition with minimal grades. My leisurely ride turned into a good workout along NW 156th street with thanks to a few rolling hills. This route took me off the trail and onto some residential streets in a couple of spots so watching out for traffic is important. Use caution when crossing Alice’s road. The tunnel going under 156th street usually has some standing water in it. Today wasn’t an exception. The temperature today resulted in some cold toes. Burr!! I need to figure out how to keep my feet warm when it’s under 40 degrees outside. No stops today other than to take pictures of the interesting things I saw along the way. Unfortunately I don’t have pictorial proof of this but, when riding through a Clive neighborhood to reconnect with the greenbelt, I met a Metro Waste garbage truck. Riding shotgun was the biggest white teddy bear I’ve ever seen, complete with a vest and stocking hat. That garbage man knows how to make his job fun! Finders Keepers! I found a golf ball just as I rode up to the Clive greenbelt and quickly stashed it in my bike bag. Hansel and Gretel must live in Clive, because I saw their playhouse along the trail. When crossing Walnut Creek north of Hickman I noticed a bike tube hanging from the branches of a tree. What?? I could almost picture the rider throwing it in the air in frustration. I returned back home to warm up with a cup of hot cocoa and a bowl of oatmeal. A great way to end a great ride.